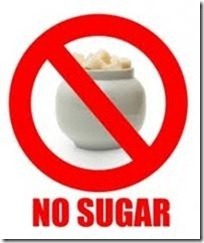 If you’ve been reading this blog you know by now that I gave up sugar for Lent last spring. I’d been aggravated by joint pain since I hit the “middle-ages” and resigned myself to living with it for the rest of my life. Within weeks of cutting sugar, the pain just disappeared. Almost every day I see a segment on the news adding more evidence that sugar is a toxic substance causing obesity, type 2 diabetes, heart disease, and cancer. Based on newer studies I believe it also contributes to inflammation which leads to joint paint and dementia. Now, I’m no expert in dietetics but I can read, and there is a growing mountain of evidence that doctors have been placing too much blame on fat, and ignoring the dangers of sugar. 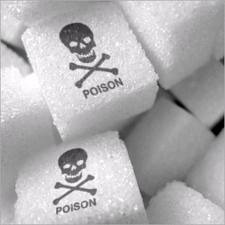 You might argue that some natural sugars have always been in the human diet, so why is this an issue? Well, yes humans have always eaten small amounts of natural sugars from fruit as part of the ancestral diet, but we’ve never historically been exposed to the massive amounts of added sugars that we see in today’s world of sweetened drinks, candies, cakes, cookies, as well as added sugars in everything from condiments to dressings to tomato sauces. 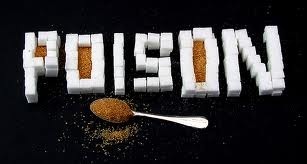 A survey shows Americans eats a sickening 130 pounds of sugar per person per year, or 1/3 pound per day! I have been a major abuser of this substance for most of my life but I’m on the wagon. Since the end of Lent, I decided to relax the “no sugar” rule but limit by sugar consumption as best I can, allowing myself 15 grams each day. Do you know how hard that is? It’s next to impossible if you eat a balanced diet. I read labels like a fiend and was delighted to discover that my favorite bread, Cobblestone Mills Rye, has only one gram of sugar per slice. But a serving of cottage cheese has three, so I nixed that. Never liked it all that much anyway. I get fighting mad when I see those lame commercials on television where the actor ends the segment by defending corn syrup by saying “Sugar is Sugar.” Liars!! High fructose corn syrup (HFCS) is a relatively new invention in the human diet and is something that your body does not know how to properly handle. HFCS didn’t really become part of the human food supply until the last century and now it’s found it fairly large quantities in almost every processed food on the grocery shelves. From experience I know that sugar activates reward centers in our brains, similar to drugs like cocaine, thereby making sugar addictive. Then it drops you off a high cliff. You hit bottom and develop brain freeze. So what about honey? Although honey and real maple syrup are mostly sugar, at least they have additional micronutrients and antioxidants that sugar or HFCS simply don’t have. Fast-digesting carb sources like breads, pastas, bagels, muffins, rice, and other grain-based foods spike your blood sugar just as quickly as regular table sugar. For example, each piece of bread you eat is basically equivalent to eating about 20 grams of sugar since the response to your blood sugar and triglyceride levels is essentially the same. But read your labels, lower options are readily available – like my rye. The bottom line is that food manufacturers want you to be addicted to sugar and continue to buy all of their junk foods and sugary drinks which destroy your health. I still indulge in chocolate, the love of my life. (I know, that’s sad isn’t it?) I discovered a couple of spoons of of Hershey’s 100% baking chocolate, mixed into a tablespoon or two of coconut oil and a spoon of Peter Pan Crunchy Peanut Butter gives me all the chocolaty goodness I crave and with only 1.5 grams of sugar! I run it in the microwave for about 1 minute and I have a fudgy treat that is the perfect ending to the perfect day. 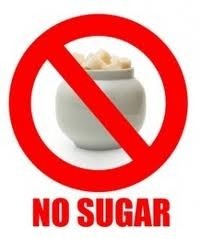 This entry was posted in Health and well-being and tagged Cut sugar to improve brain function, Evils of sugar, Sugar worse than fat, Sugaring poisoning by Emily Jones. Bookmark the permalink. Well, darn, I just got my “Christmas in July” BlueBell!!! Go ahead and Enjoy – rules are made to be broken or life gets too boring. I feasted on Christmas in July too, but been in a fog ever since. It will lift eventually.